Over the winter we introduced a new service for our dog boarding customers. In October we built a fully contained play yard. The yard is 60 feet by 30 feet and with a 6 feet fence. 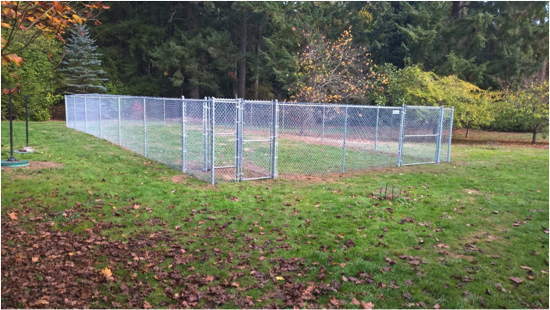 The fencing is buried 4 inches into the ground to deter dogs trying to dig under the fence. Access to the yard is a dual gate which allows better control of the dog when entering and leaving the yard. Once in the play yard dogs are let off leash and they can chase a ball, Frisbee, or just run around. Dogs are allowed in the yard only one at a time and with supervision. We have provided walks as a way to get dogs out of the kennel, but for many high energy breeds the chance to safely go off leash and run around is a welcome treat.